Three generations have gone before us; four generations strive to continue the family legacy of hard work, creativity and excellent product through our passion for the land and our family. Each generation has lived off the land using responsible farming practices that are safe for our families, our workers and future generations - we were sustainable farmers before the word sustainable was in vogue. We give thanks for our past and look forward with great anticipation toward our promising future. 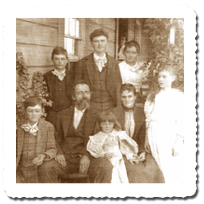 The William Ernst Family, Howie's maternal Great Grandparents, moved from Geneseo, Illinois to Geneseo, California in 1884 and named it after their home town in Illinois. Geneseo, CA is located just 4 miles East of Paso Robles and just a few miles south and east of the family's current vineyards. The Ernst family planted 25 varieties of grapes, most probably taking cuttings from a UC Davis experimental project in Paso Robles (began in 1865?). The Ernst family made wine from those grapes and "supplied a portion of the trade of Paso Robles" - see the News Page for articles from 1900 and 1901. 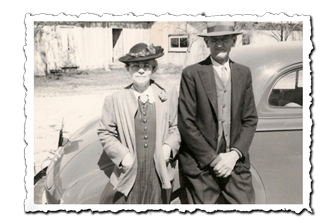 Frank and Rosie Ernst, Howie’s grandparents on his mother’s side, purchased what is now Steinbeck Vineyards in 1921. The background of this photo, taken in 1948 just shortly before Frank’s death, is the blacksmith shop – site of our wine tasting room. 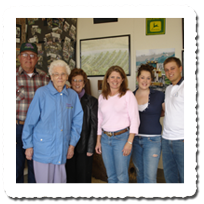 Hazel Steinbeck, the matriarch of the family is flanked by Howie & Bev on the left and Cindy, Caitlin & Ryan on the right in a photo taken a few years before her death at 97 years old in 2007. Her passion for her family led her to call her 4 children, 16 grandchildren and 43 greatgrandchildren on their birthdays each year. She loved talking about the family businesses and was so proud that her son, granddaughter and great-grandson and their families continue the fine pioneering traditions of her parents and grandparents. Howie and Bev Steinbeck, highschool sweethearts, remain strong companions and friends as they have raised their four children and watched their seven grandchildren grow up. Howie's passion for farming began at 4 years old at his grandfather's side, now he's the grandfather teaching his grandson the grape growing business. 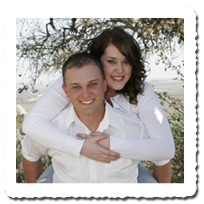 The Steinbeck’s are known for their hospitality and for the food and experiences they create for guests. Howie has been a leader in viticulture in Paso Robles since 1970. The creation of the Steinbeck label gives the family opportunity to tell our stories and share our passion for life in the vineyard. Birthday Tribute to Howie - written by Keith SteinbeckThe Central Coast produces wines and families, both rich in character. With roots deep in soil and tradition, strong with sun and care, generations have brought for the land’s bounty; steady hands and earnest work and honest rest.From generation to generation: father, son, daughter, sister, brother, wife — lessons learned and wisdom earned and the hope that the seasons next may bear truer fruit of deeper roots. A pruning, a firm hand, direction, discipline; all to a successful harvest.In wine as in the lives of men; strength, character, integrity are the hallmarks of greatness; qualities that stand the test of time. From humble beginning both: the vine and the boy, to the grape and the man, now the vintage and the grandfather; shaped by years and experience, faith, love and commitment; presented here not as an end, but as a new beginning, another season of growth and blessings. Cindy Steinbeck moved back home in 1997 after a career in family life ministry to help with the family's growing vineyard business. Cindy is head of marketing, wine sales and public relations. 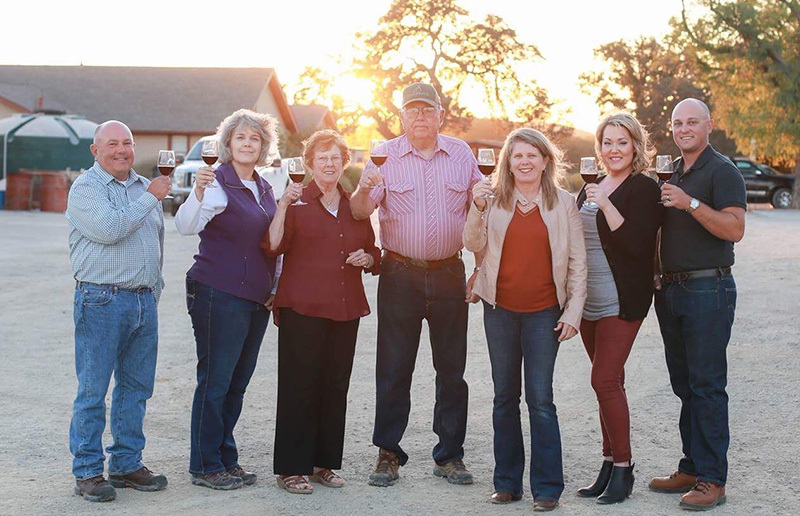 Her desire to create an expression of their passion for wine, together with her commitment to the success of Howie & Bev’s businesses led her to create Steinbeck Vineyards & Winery. The boutique tasting room and the CRASH COURSES at Steinbeck Vineyards in their expansive vineyards gives guests an opportunity to really know the family and experience wine from the vineyard. Cindy travels extensively selling wine and also serving as a guest speaker at Christian events around the country. She's written three books, The Vine Speaks, Grapes of Grace and The Rock Speaks, all of which reflect her passion for the vineyards and her faith. Cindy's daughter Stacy and her husband Bryan work in the wine industry in Tasmania, Australia. Growing up Ryan always knew his dream was to work side-by-side with his Grandpa, Howie, to continue the family legacy. In 2004, he left to attend California State University, Fresno where he met his wife Caitlin. He already has many years experience in viticulture and is Operations Manager for our vineyards. Ryan and Caitlin have two children, Bradley and Amelia.